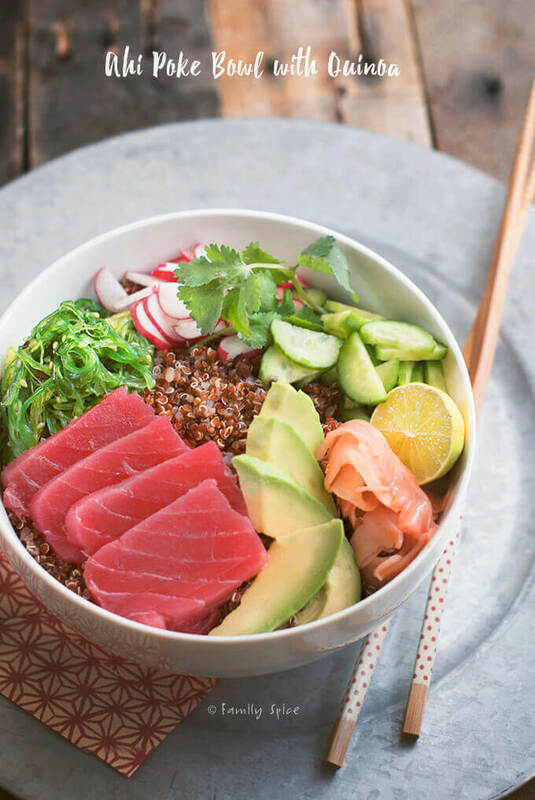 Bring the taste of Hawaii to your table, but add a bit of a California twist with this Ahi Poke Bowl with Quinoa and Avocado. I was introduced to sushi in my twenties, when I was living in Miami. It wasn’t a cultural phenomenon back then, but something new and exotic. For this Texas girl, eating raw fish way out of my culinary comfort zone. I learned a lot about food and myself during those years in Miami. I was fresh out of college, working 60-hours a week in an advertising agency and continuously trying new foods and exploring new places. And now, almost 20 years later, I haven’t quite lost my sense of adventure – although it has been sidetracked for a bit. My adventures are with the kids. I enjoy watching their eyes glow while experiencing something new: a new taste or a new thrill. Several years ago we managed to take the kids to the Big island of Hawaii. All five of us savored every second we were there. The ocean was the same Pacific ocean we swim in here in San Diego, but it was warmer and bluer than at home. The beaches were different, the produce was different and of course, the seafood was different. Although I had enjoyed poke in California, there was something surreal about enjoying this Hawaiian dish in Hawaii. 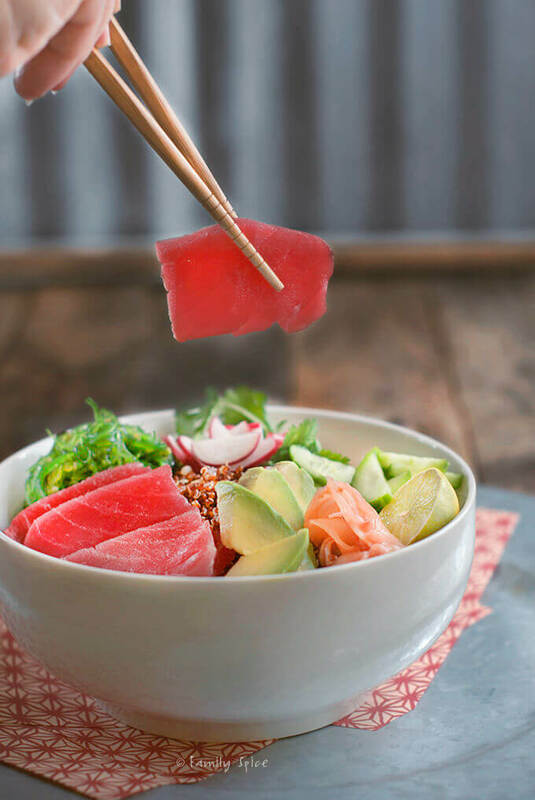 Poke means “chunk” in Hawaiian, and the Ahi Poke Bowl is typically raw ahi tuna cut into chunks with a special sauce. But the beauty of the food world, is that you can create this dish, as well as any other dishes, and develop it with your own twist and interpretation. Several weeks ago, a friend of mine introduced me to a new restaurant. On the menu was an Ahi Poke Bowl. You had the option of eating it with rice or quinoa. 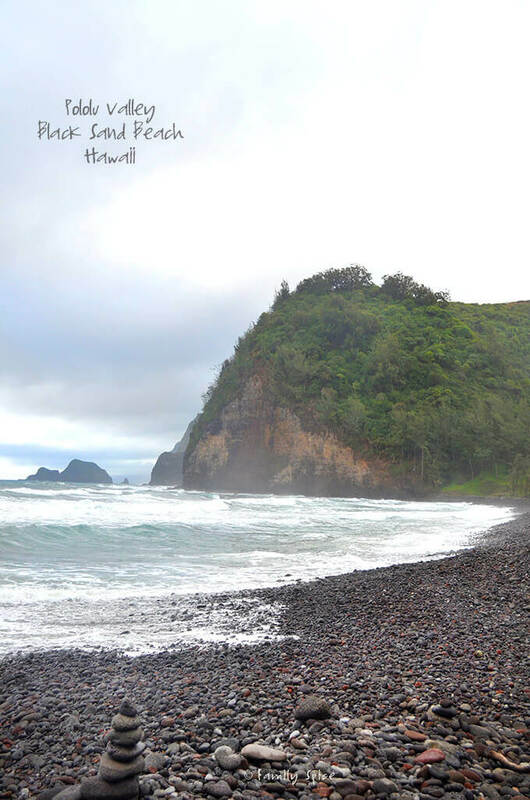 I reminded again of my mesmerizing trip to Hawaii. Why hadn’t I made this at home before? I have many Asian markets close to me so I quickly visited them after my lunch. I purchase sushi grade ahi tuna and salmon. No rules limit your poke to just tuna. I have pictured ahi tuna, but enjoyed this poke bowl with salmon or yellow tail, too. 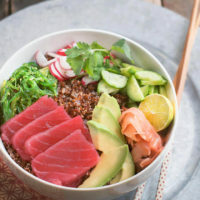 I served my Ahi Poke Bowl over a bed of quinoa pilaf, but you can also use brown rice or white rice. For low-carbers, you can use shredded cabbage. The rest of accompaniments are up to, but I used cucumber, radish, seaweed salad (bought at the store, but here’s a recipe to make your own), pickled ginger, fresh cilantro and avocado – because in California, you serve everything with avocado! Where do your culinary adventures take you? 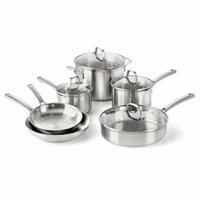 In a small pot bring 2 cups water to boil. When water is boiling, transfer rinsed quinoa and return to boil. 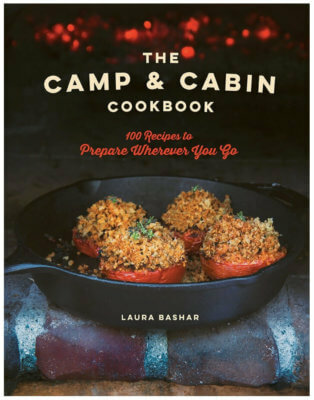 Cover, reduce heat to low and continue to cook until the water is gone and quinoa is cooked, about 12-15 minutes. Remove lid to pot and allow quinoa to cool. For the dressing, whisk together soy sauce, lime juice, sesame oil and hot sauce. Once quinoa has cooled to room temperature, divide evenly in six bowls. Divide quinoa evenly into 6 bowls. Divide remaining ingredients evenly between the 6 bowls and serve with dressing. Serving Suggestions: Serve with other sides: green onions, red onions, sesame seeds and/or jalapeño slices. 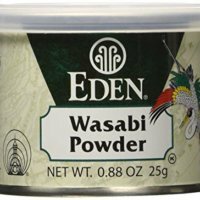 If you like wasabi, serve with that, too. 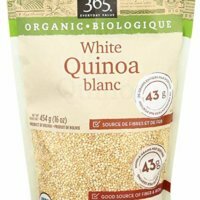 Cooking Tips: Not a fan of quinoa? Use white or brown rice instead. Very clever, Laura! I like the term “sushi deconstructed”. A fusion of Hawaiian, Japanese and with touch of Californian. Brilliant! 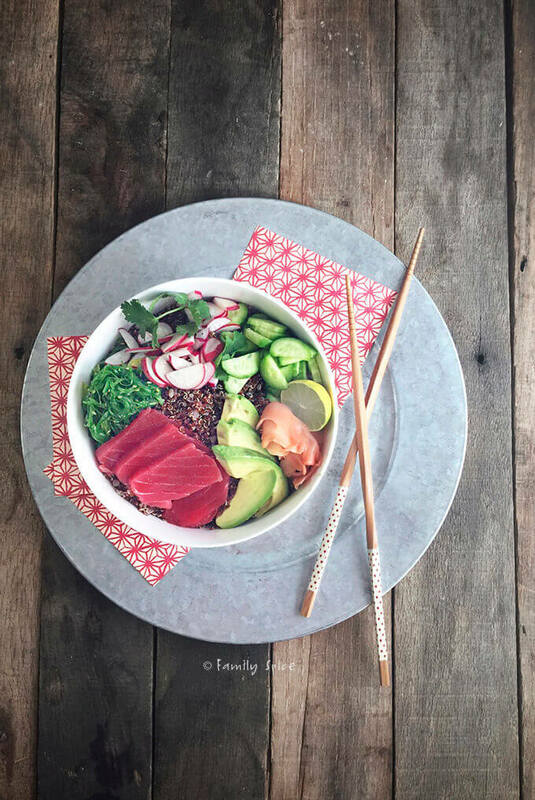 That is one beautiful and vibrantly colorful poke bowl! I just had poke from Bristol Farms for my birthday dinner…it was awesome! I loved it ever since I tried it in Hawaii. Great recipe! So my kind of a bowl! It looks fresh, nutritious and delicious! My daughters love sushi and sashimi. This would be a great lunch for the youngest who’s 15. We have a poke place in Old Town Pasadena that’s one of their favorite lunch places. This is beautiful! I’m fairly new to eating sushi, my fiancé introduced it to me 5 years ago, but now I’m addicted. It’s just so delicious! I really thought I wouldn’t like it as I was put off by the fact it was raw, but how wrong I was; it’s delicious!